Installation of outdoor Data Bridge antennas offers a great alternative to fixed network lines. 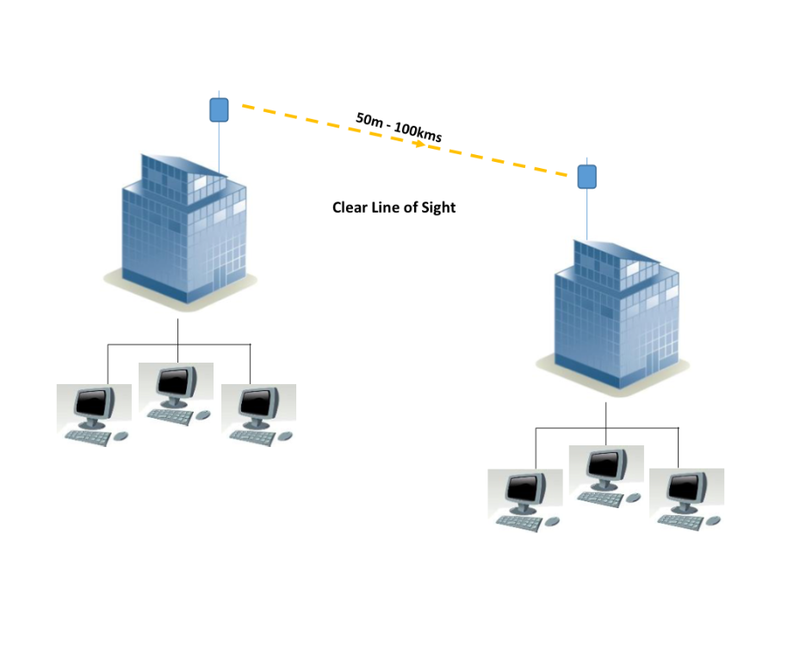 This method of wireless data transmission provides connectivity to office networks between different buildings and sites. It is particularly handy when extra premises are added during renovations. Running underground communications and paying extra for new landline connections can be quite expensive. Creating a Data Bridge between a main building and newly build additions is a more cost efficient option. It can also be a perfect temporary solution for companies that lease their premises or have portable offices connected to their main office network. Wireless Data Bridge networks are movable, easy to install and flexible. They can be set up as Point-to-Point or Point-to-Multipoint configurations. While the obvious visual line of sight is easy to assess, an additional understanding of the way radio waves travel is imperative. A radio wave range varies from one antenna to another and can stretch out from 50m to hundreds of kilometres. Choosing the right type of antenna for data bridge transmission will eliminate interference from surrounding buildings and provide you with the highest signal strength and stability. Sydney Antennas technicians use equipment designed specifically for harsh outdoor environments, mounted on durable brackets and connected with high quality cables. Our installers combine their experience in radio wave transmission field with the knowledge of latest data bridge products available on the market. Call us to enquire about Network bridge installations and one of our experts will be at your door to provide with you the best solution.